Sorry about the blog hiatus. During the summer, without teaching classes, inspiration is harder to come by. But, tonight I cooked a steak. I recently got a new digital meat thermometer. My plan was to slowly cook the steak until the internal temperature got to be about 140 degrees Fahrenheit with the oven at 200 degrees, take it out, wrap in tin foil, crank the oven to 500 degrees, stick it back in, and give it a nice exterior, reaching an internal temperature of about 150 degrees which would put it at about medium. After I put the steak into the oven though, I started to watch the temperature go up on my digital thermometer and thought, why not take data. And so I did. Here are the results. Above you see the internal temperature of the steak as a function of time. First some comments about the graph. The steak started at 37 degrees, the temperature of my refrigerator. I didn't start taking data until about 20 minutes in. The red dashed lines mark where I turned up the temperature of the oven. It started at 200 degrees, then 250, then 300, and in the final stretch, 500 with the broiler. The green dotted lines mark where I got impatient and opened the door to the over to check on the food. The yellow background denotes where the steak was outside of the oven resting in tinfoil. 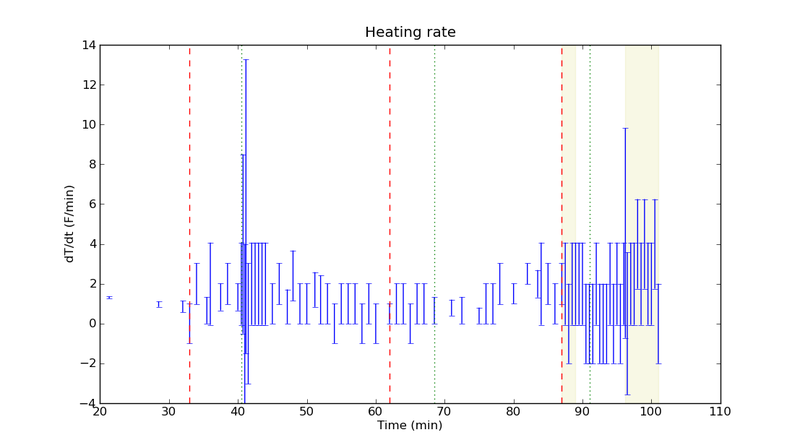 You can clearly see a change in the data when I changed the oven temperature. The temperature of the center of the steak continues to rise after you take it out of the oven. In fact, curiously enough, the temperature of the center of the steak seems to have risen the quickest after it was taken out of the oven. 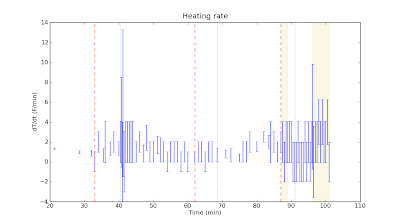 Next I decided to look at the heating rate, computed by taking the finite differences of my data points and propagating the errors. As you'll see, I really didn't have enough data points or a precise enough thermometer to really see the changes in the heating rate. Finally some comments about the food. The steak was good. You'll notice I shot past 150, ended up with a temperature of about 160, and a steak that was nearly medium well. Cooking the steak slowly like this yielded as pretty soft texture, akin to a roast. Heck, I essentially roasted the steak. The steak was served with asparagus and baked potatoes. As an interesting aside, the baked potatoes were in the oven along with the steak the whole time, but did not cook all the way through. I normally bake potatoes at 350 for about an hour, and here they were in a hot oven for over an hour and a half, half an hour of which was above 300, but they didn't cook through. I clearly have too much time on my hands. I have one more steak, and I think I'll try a different cooking method. Maybe I'll have the patience to take data again, we'll see.